What happens if your dog gets hit by a car? What should I wear to my deposition for my car accident case? 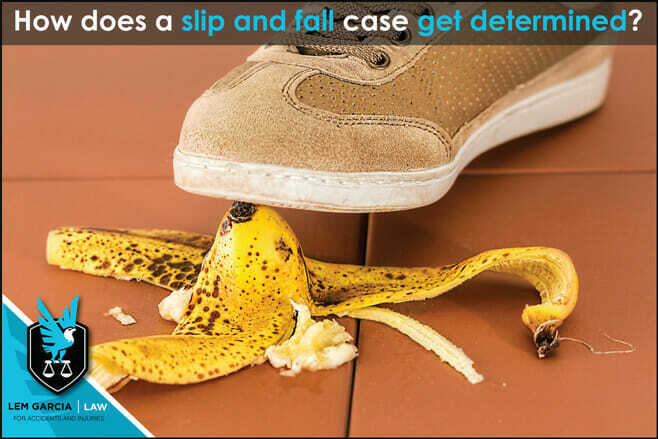 How does a slip and fall case get determined? When a personal injury lawyer is determining if a slip and fall case is worth pursuing, or even considering, the lawyer has to look for some prerequisites. 1: Which party involved is liable? 2: What party involved is at fault? and 3: Was the person who fell, part of the accident by fault of their own in anyway? Negligence is the thing that lawyers look for to determine the breadth of a case. This is classified as a dangerous situation such as a wet floor after being mopped, uneven pavement or even dirt or loose gravel. Where is gets tricky is when the lawyer has to assess whether the plaintiff could have seen that there was a dangerous hazard to voice and determine whether the liable party had the means to prevent the hazardous area. Conditions that get factored in when making a slip and fall case can include poor lighting, lack of company policy on making sure hazardous areas are kept clear or clean, as well as determining if limited visibility should be considered. In some cases, the plaintiff could have contributed to the slip and fall. If it is determined that the one who fell contributed to any sustained injuries, they can be partially liable and, in most cases, this means that the full responsibility of the business or property owner is null and void. Common injuries that come with slip and fall accidents include head, neck, and back injuries, and in the case of the elderly, even pelvic injures can occur. If you have been injured in a slip and fall accident and it was not your fault, you’ll want to get a hold of a good lawyer and arrange a consultation. We here at Lem Garcia Law handle slip and fall cases.